Directional signage – a new offer to all tenants. See below or the separate page for this amenity. Up-coming events are published on the website calendar which you can see by CLICKING HERE. We are very happy to add your events, sales and other information to the calendar – just let us know by emailing to marketing@uptownstation.com. We have a number of events planned where we would welcome the participation of our tenants, some of these are listed below. 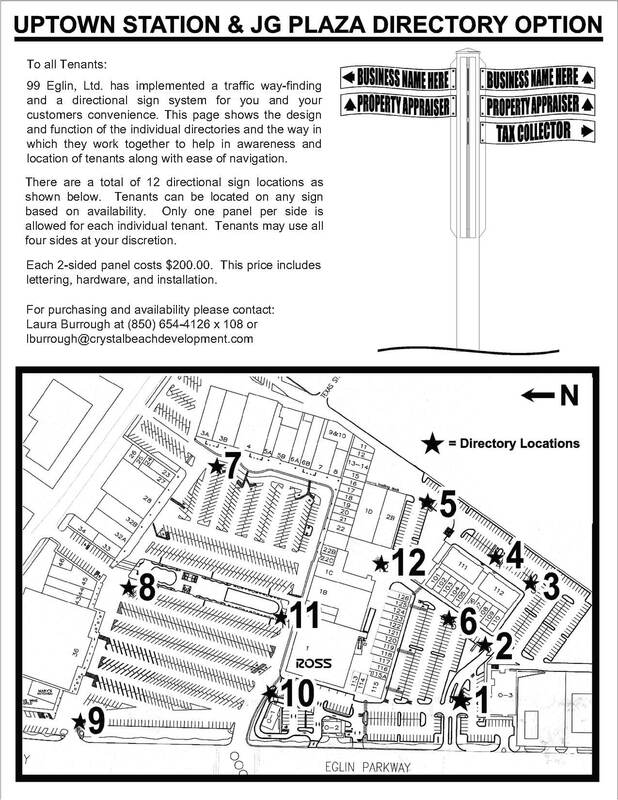 Just email or call Krystle Johnson at 850 654 4126 X116, kjohnson@crystalbeachdevelopment.com. Facebook – Uptown Station has a Facebook page and a Twitter feed. We are very happy to pass on details of your events, sales, specials or just news to our Fans (we have over 1300 local fans on Facebook). If you have a Facebook Fan page for your company or store, let us know and we’ll put the address on your Store Directory page. Store Directory - Please check the information covering your store on the store directory pages – let us know if there are any changes or you want any more information listed. 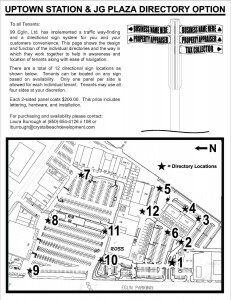 This will also be shown on Store Directory maps throughout the complex and on flyers distributed to Condos and Hotels in the area. Backstage Pass – We are continuing to develop Backstage Pass, the breeze-way between the old and new parts of Uptown Station. This is being planned as an entertainment area suitable for small concerts and performances and small events. We are creating a spectacular entrance way for Backstage Pass. If you would like to plan events in Backstage Pass, call 850 654 4126 X116. 2nd Annual Uptown Shopping District Beer Festival - On Saturday November 12th we will be holding the second annual Greater Gulf Coast Beer Festival. The event is a cooperation between the Uptown Station and Chan’s Wine World. The aim is to attract a large number of shoppers into our area of Fort Walton Beach. More details soon will be published on the Uptown Station website, but please contact us in Marketing if you would like to join in with this event, would like more information or have any questions. Movie Nights - Movie Nights run throughout the year from April to October. We show a movie on Saturday night approximately every two weeks during the summer and once a month during the winter. The full schedule is on the events calendar. These are a great opportunity to promote your business. Please call us to discuss how we can work together.